Repeatedly voted the favorite city of the French themselves, Aix, unlike Paris, allowed students to feel comfortable and at home within a very short time. 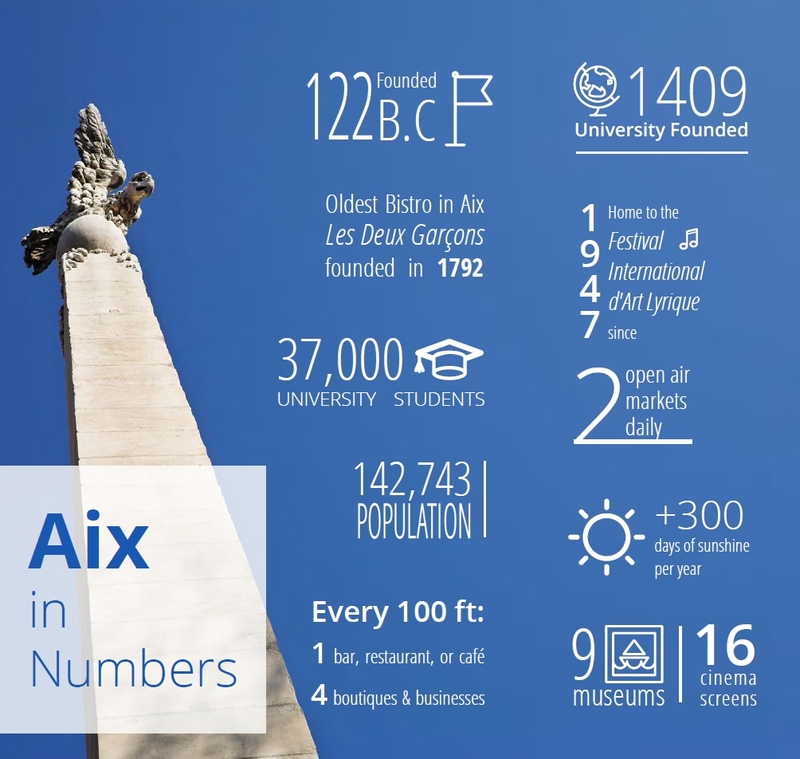 Intimate yet cosmopolitan, sunny and studious, with a vibrant student population and an active nightlife, Aix offers countless opportunities for rich cultural contacts and lasting friendships. Aix-en-Provence lies at the heart of one of the most charmed regions in France…Provence. Founded by the Romans, ruled by the Counts of Provence, birthplace of Emile Zola and Paul Cézanne, Aix combines stately historical beauty and a lively, modern spirit. Numerous sidewalk cafés, open-air markets, restaurants, shops, museums and cinemas set the scene for an active social life. The city is home to a world-renowned international music and opera festival and hosts the Ballet Preljocaj directed by one of France’s foremost contemporary choreographers. Aix is just thirty minutes by train from France’s bustling second city, Marseille, fifteen minutes from the TGV high-speed train line to Avignon, Lyon and Paris, and midway on the main route joining Barcelona and Northern Italy. The Marseille-Provence airport, France’s most active airport outside Paris, offers easy international access to Aix and the region. The AUCP Aix-en-Provence was housed at La Maison des Palmiers, built in the mid-1800’s. The former home of a member of French Parliament and a leader of WWII resistance efforts in Provence, the grand house is conveniently located steps from the center of Aix. The AUCP was situated next to a spacious public park and just opposite one of France’s leading grandes écoles of engineering as well as other French schools. Open air markets just a three-minute walk away display a quality of fresh farm produce only available in Provence, perfect ingredients for leisurely lunches in the garden à la Provençale! Safe, modern and France’s center of ethnic diversity, Marseille is a city on the sea and the living crossroads of culture and language. France’s largest port, Marseille possesses a strong, proud identity, largely unspoiled by globalization. 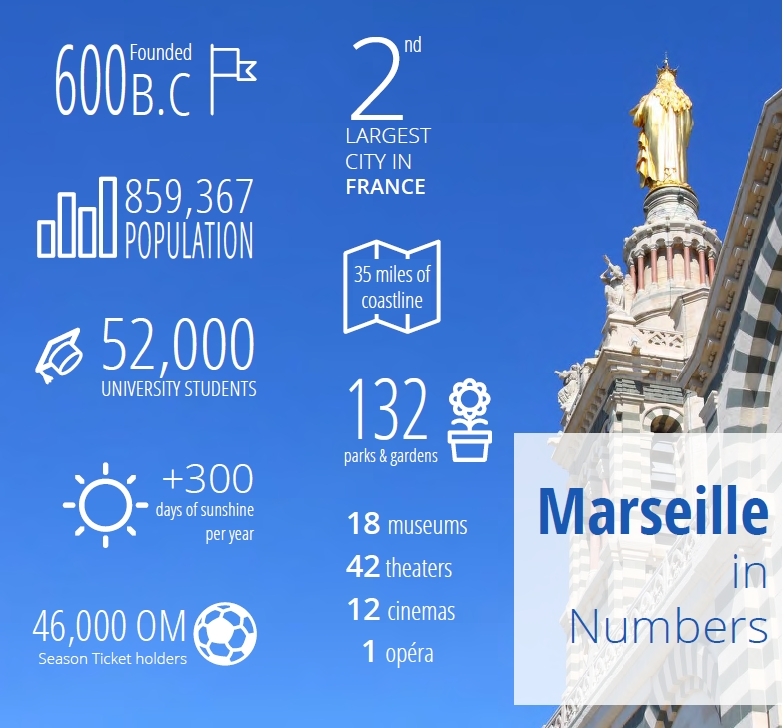 Founded by Greek sailors in 600BC, Marseille later fell under Roman rule. With twenty-six centuries of history, the city is at the same time bustling and young. Marseille has a centuries-old tradition of intercultural exchange and religious pluralism, and has seen successive waves of immigration from Spain, Italy, Africa and the Middle East. With France’s largest public university, Aix-Marseille University, Marseille has countless activities adapted to student life. The thirty-five mile coastline offers both incomparable beauty and numerous possibilities for sailing, diving and kayaking. Elected as the 2013 European Capital of Culture, Marseille also has a rich cultural atmosphere; numerous museums as well as theatre, opera and dance companies call the city home. Top rock and electronic groups regularly play the city, which also boasts one of France’s best underground rap scenes. An extensive metro, tram and bus system links the diverse neighborhoods and their cafés, shops, and sports arenas, making the city easily accessible to the 20,000-plus student population. AUCP Marseille shared convenient downtown premises with the American Center, established in 1989. Situated in a historic building close to numerous bus and metro lines, the center is just two blocks away from the American Consulate and the French Préfecture. The word I always find myself using to describe Marseille is “mélange”. Partway between North African and French cultures, it has a unique character that quickly made it one of my favorite cities in the world.